*Please note that Heirloom Organics has no way to track any purchases made by your clicking from our site to theirs, yet we feel that it would be an injustice to deprive our customers of the invaluable gardening knowledge put at your fingertips on the Heirloom-Organics pages. When you visit their pages, we would very much appreciate your returning to GET ME PREPARED and placing your seed orders from our site so that we will be credited for the purchase. There is no difference in the price. Thank you! Non-Hybrid Seed Packs are the sustainable gardening choice of home, homestead and professional gardeners throughout North America. Whether you are in the city, suburbs or country, Heirloom Organics Seed Packs are designed with your specific space, light and nutritional needs in mind. With our Seed Vault, growing your own survival garden becomes easy. Be assured, our seeds are not hybrid or genetically modified. You save your harvest seeds from this year and have more than enough to plant next year. You never have to buy seeds again! Not possible with hybrid or GM (genetically modified) seeds. Now you can grow your Survival Garden for bountiful harvest anywhere in the country. Chosen for varieties that have stood the test of time and proven they will grow in all zones. Feed 4 people for 1 year. This is a great buy! 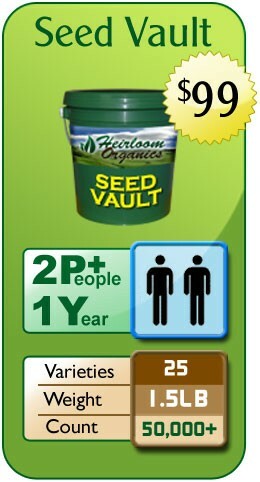 The Family Pack is almost TWICE the seeds of the Seed Vault for only $50 more. Specifically designed to provide optimum nutrition in the space provided from a family yard with LOTS of seed to put away for next year. This pack contains an excellent cross-section of varieties that do well in all zones, in all soil and light conditions. A good balance of leafy and fruiting varieties provides the best overall nutritional and agricultural options for the suburban back yard. The Family Pack will supply your family with excellent nutrition throughout the year (outdoor and indoor varieties) with lots of seed to store and keep for future years. Vegetables, Fruits, Grain and Legumes abound in this Pack! For city-dwellers, try our Seed Vault. For wholesale, investment-grade seeds, see the Homestead and Farm Packs Seed Pack ContentsThe Family Pack contains 30 varieties of high-nutrient vegetables, grains and legumes for approximately 4+ people for approximately 1+ year with LOTs to store. All varieties are 100% non-hybrid, allowing you to save the seeds for future planting. At 2.7LB weight and 94,000+ seed count, this pack is a must-have for securing your family's nutritional future. Many families buy 2 so that you can store one for years and use the other.Still deciding? See our Pack Comparison chart for an overview. 7 Things You Should Know When Purchasing Seeds". 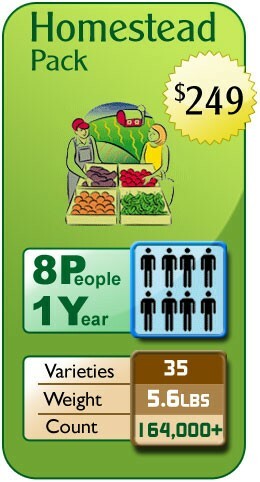 Feed 8 people for 1 year or plan to grow more than you need and have some left for charity or to sell. There will always be a market for food! The Homestead Pack is the SEED INVESTORS CHOICE. It is designed for up to 8 people with 1 Acre+ growing space or for bulk seed storage, secure investment and bartering. This is the perfect seed pack for a family that wants to have a LARGE garden this year and wants LOTS of extra seed for storage. Many families or groups buy 2 homestead packs to make sure they have MANY YEARS of seeds supply or barter currency no matter what. With the volatility of today’s financial markets and food supply chain, there is no better investment you can make than in seeds, the future of food supply. The Homestead Pack and Farm Packs are "INVESTMENT GRADE" Seed Packs. For family use, gardening and storage try the Family Pack. For personal gardening and food security try the Seed Vault. The Heirloom Organics Farm Pack is designed for farms, large-scale storage, seed investment and for groups, large and small. This pack includes very large amounts of many vegetable, fruit, grain and legume varieties. The Heirloom Organics Non-Hybrid Farm Pack is the #1 selling large quantity non-hybrid seed set in the world. Whether you are supporting a commercial farm or simply storing a large quantity of seed for investment, the Heirloom Organics Non-Hybrid Farm Pack is the best value you can get. Many groups and organizations buy 2 or more Farm Packs to make sure they have MANY YEARS of seed supply for large groups of people, no matter what. 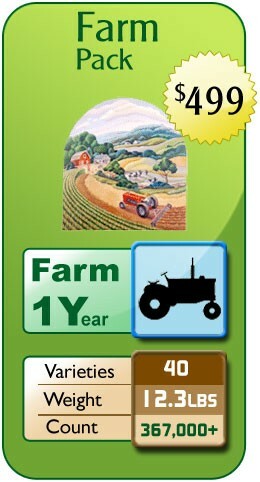 The Farm Pack and Homestead Pack are "INVESTMENT GRADE" Seed Packs. For family use and storage try the Family Pack or for large families, The Homestead Pack. For personal gardening and food security try the Seed Vault.